"Finally, a sampling of care plans that activity staff can use as guidelines to create meaningful, individualized, Resident plans." --Joan Anderson, RTR, CTRS, ACC. The need for a practical book to assist Activity Professionals with their documentation and care plan development was echoed loudly for years. Activity Professionals and assistants who were new in the field often had no gained the vocabulary or phraseology to condense their Resident needs into concise and effective plans for care. Experienced professionals needed alternate wording and interventions to help create more individualized and interdisciplinary care plans. This third edition includes coding for the new Quality Indicators and include more care plans for our changing Resident populations. The Quality Indicators are specific areas of concern identified through MDS data transmissions to the state. The Quality Indicator Reports help both facilities and surveyors to identify areas of concern and Residents at risk for focused review. 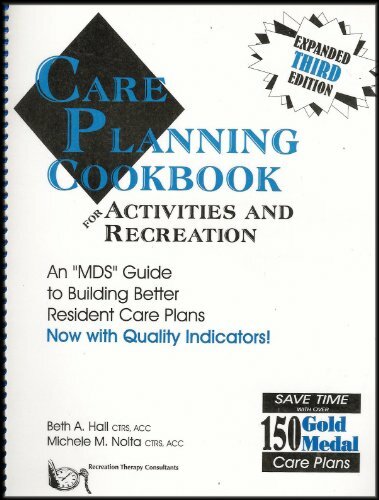 The Care Planning Cookbook for Activities and Recreation continues to assist Activity Professionals and Recreation Therapists to develop better, faster, and more effective plans of care. CONTENTS OF MAJOR UNITS: 1) Manual Organization 2) Gold Medal Care Plans 3) 7-Step Activity Care Plan Guide 4) Emotions and Descriptions 5) Verbs - Goals or Approaches 6) MDS 2.0 7) RAP-Indicated Issues 8) Social Interactions 9) Physical Conditions 10) Emotional Issues 11) Mental Abilities 12) Leisure Interests.